Who you are and your vision must never be reduced to one agent or one participant in your corporation. Real Estate is a wonderful industry, and it is driven by big pay rewards at times, and this fact, on it own, creates ‘Huge Egos’ and entitlement from the few agents you think are succeeding for you. This blog post is for Brokers/Managers; I have a few simple questions to ask of you: If some unfortunate life terminating act happens to one of your superstar agents; does this mean that your business over? Will Real Estate in your market stop functioning because of the demise of one of your, or other, local superstar agents? If your answer is ‘Yes’ to either to these questions then you are Not a Real Estate Brokerage, and your Business Plan is weak and lacking of a grand vision. 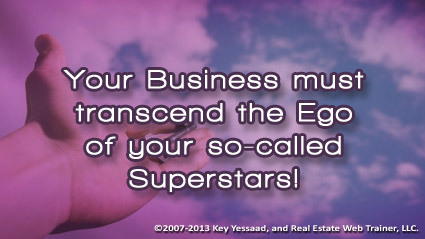 You are the Leader of your office, and as such, must nurture new talent to grow and succeed in your office; if the ego of one of your superstars starts interfering with the growth and success of your business plan then stop being a Real Estate Brokerage and get yourself a regular job – sorry :(.